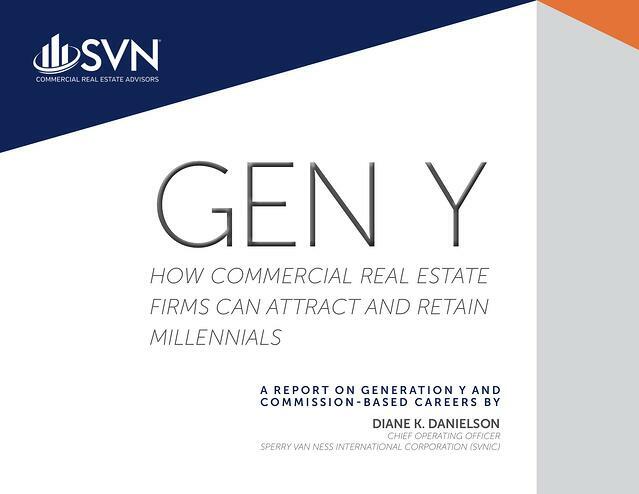 SVN International Corp. (SVNIC), a commercial real estate franchisor, surveyed over 325 members of Generation Y (b. 1980 to 1995) in the United States, Canada and South America about careers, specifically asking about commission-based jobs and what they are looking for in future employers. The following report provides an overview of 10 recommendations for the CRE industry, including the data that supports them. It should be noted that many of the recommendations are interconnected and would benefit more than Millennial employees. 1. Expand your commission-based recruiting pool. With many top candidates hampered by student loans, the number of individuals who feel they can take on a commission-only job is decreasing. 2. Create a collaborative work environment through common goals, brainstorming and problem solving sessions. Bolster this with collaborative tools and workplace office design. 3. Boost your entrepreneurial spirit by rewarding innovation, supporting risk taking, and encouraging employees to think like owners. Find out the rest by downloading the full report. This study is just one example of SVNIC’s on-going efforts to assist their independently owned and operated offices across the globe in recruiting top talent and diversifying their companies. Find out more at www.SVN.com.